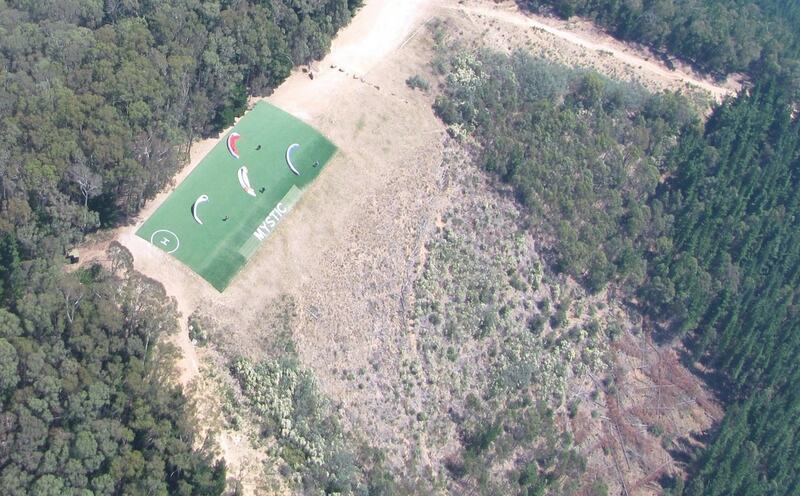 We are based around the Mystic Flight Park in Bright which has hosted many national and international competitions including 2 PWC World Cups. 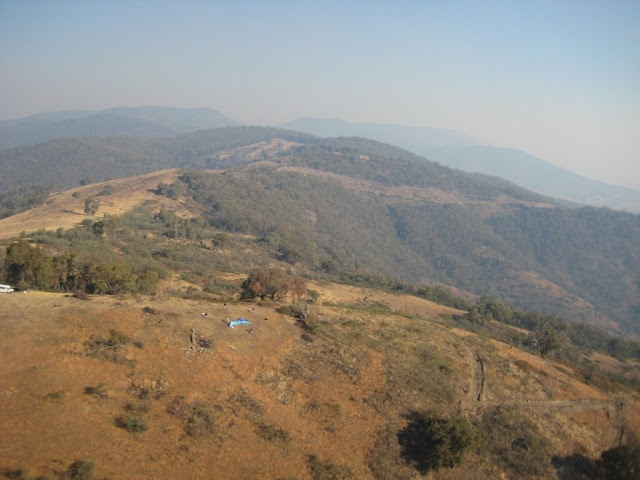 The bright flying site is located in Victorian Alps to the North East of Melbourne enclosed by a beautiful mountain scenery of various national parks. It is situated in between Mount Buffalo, Mount Bogong and Mount Feathertop that dominate about 1000 to 1200 m above the valley with peaks about 1500 to 1800 ASL. There are two most common used takes off Mystic and Gundowring. Both sites are privately owned. Ridge soaring, once above the height of the trees behind the launch is quite easy ( sometimes rough). In the system to get to that height, passes across the launch bowl in the best lift are often required. 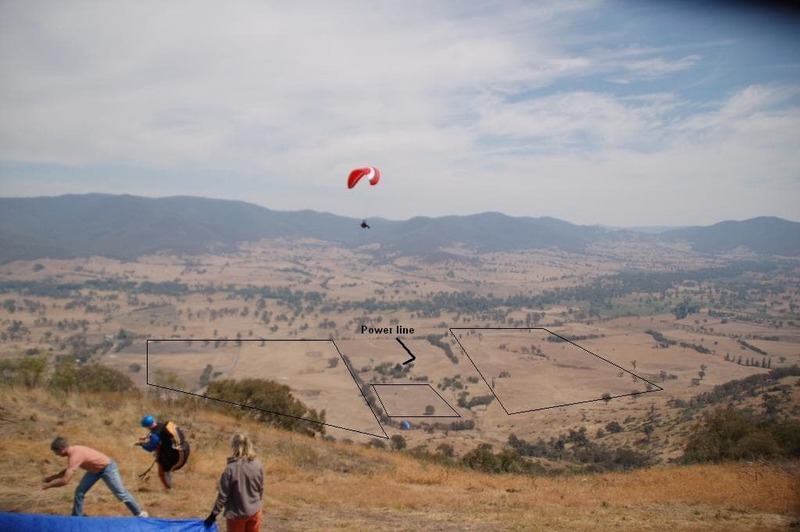 Already below launch altitude, head towards the landing paddock and you may be lucky and catch a thermal above the spur on the way down. When thermal there are a number of spots to head for. Thermals seem to find over the spurs to the left and right. In overall, the entire hill is a trigger spot so be prepared for some monster lift straight away. During summer, the lift is quite strong and sharp between 12 and 3:30 pm. It is reliable and more fun to launch before or after. Many great XC flight have been achieved after launching as late as 5:30 pm. While other terms Bright hill can be flown almost anytime. The site is centered amongst prime alpine flying country, so excellent XC flights are possible. Across the back to Harrietville, best to Tawonga Gap and the Kiewa Valley, or left to Porepunkah Hill, the Ovens Valley, Mt Buffalo, Myrtleford and onwards. At major days try for Wangaratta or the McDonalds on the Hume Highway SW of Wangaratta. Mystic Hill is an attractive site which is often on because it faces the valley wind and cooks up some powerful thermals. It is placed 2 Km south of Bright just off the road to Wandiligong. One of some most famous Victorian Inland Sites which has hosted many states, national competitions including a Paragliding World Cup event in 1998. There is one weather service on Mystic Hill; CH 21 UHF [Click transmit key 3 - 4 times to actuate]. A Mystic flying pass must be purchased before using this site, and can only be obtained over the NE Vic HG club website at www.nevhgc.net. Mystic Hill is placed 2Km southland of Bright just off the road to Wandiligong. 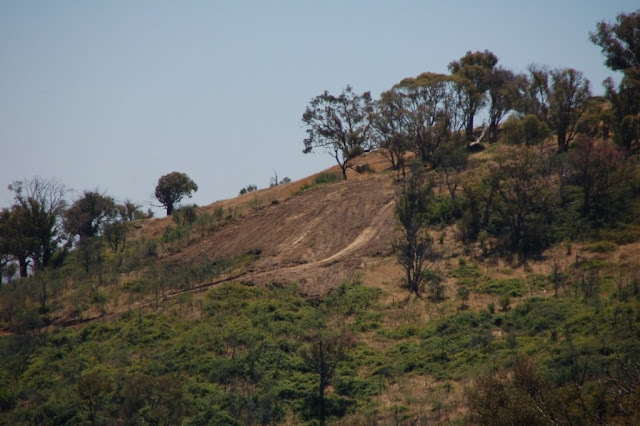 Take-off is the site as all pine trees have been cut down over the entire face of the hill. It claims the reliable launch area (about 90m away) of all the sites in this region. If possible, just one of the numerous local pilots show you the site for the first time as there are some shortcomings which have caught many pilots off guard? About T/O that landing enclosure cannot be seen as it is shielded by the spur to the eastern. It is a great approach to survey the landing paddock first and then on the drive up, stop as you round the spur and sight it again from above before you fly. To paragliders and hang-gliders (if people can bear the relatively short approach), there is a new landing ground on the right-hand side of the road on the way to Wandilagong. A vehicle park is located at the end of the landing spot. The main bomb out for hang gliders is across the Wandiligong rd, east of the smaller paddock. Look for the stile over the fence. The main threats are the trees (normally) upwind creating turbulence, as the valley breeze blows most of the time from the NW. Expect turbulence on any normal summer’s day. Powerful lift in the summertime during the midst of the day. Power lines along the road near landing ground. Large areas of 'tiger' land to South, and between Pyramid Hill and the Kiewa Valley. Before running XC, please check the map for allowed and forbidden landing enclosures in the area. The mountain is privately controlled by Bob Saville, who in 2009 opened it as a free-flying site for all. Bob welcomes anyone to fly from the hill as long as the flier is a member of the HGFA, this ensures both yourself and him. Strictly no smoking while on the property. Please take all your rubbish home with you. There are no toilets on the hill. Please stay discrete. Ideally, dig a tunnel, do the toilet and fill in space. Driving on the property is at your individual risk. Be alert if, at any time you have to go off the cut mark, there are many wombat spaces on the property. All the local landowners are happy for pilots to land on their property. Please give them the royal honor, be polite and follow the standard countryside code. The Bright Paragliding Open Championship is open to all pilots with a minimum of an Australian PG4 rating or equivalent. For pilot selection, the top 40 from the previous season's Aussie ladder will be invited to pay first. People will have until the 30 August to pay the entry fee to secure a station. After the 30 Aug the remaining places open to all pilots, allocated in order of payment received. There is a shuttle van that runs every 10 min from the terminal to Melbourne Southern Cross train station. There is a train going to Albury from Melbourne Southern Cross 2-3 times a day. Check the timetable here http://www.vline.com.au/ The journey takes about 4 hours. it can be a straightforward train or with change at Seymour. There is no city bus from Albury hardly taxi or transfer. Bright is situated on the Great Alpine Road (B 500) about 75 km from the Hume Highway (M31) which is the main road connecting Melbourne to Sydney. Clear is only over three hours journey from Melbourne, seven hours drive from Sydney, five hours drive from Canberra and twelve hours drive from Adelaide. A great round tour from Melbourne is to travel from Melbourne to Bairnsdale on the Princes Hwy then over the High Country on the Great Alpine Road and then back to Melbourne via the Hume Hwy. If you are arriving from Sydney or Canberra experience the stunning drive via the Snowy Mountains through Thredbo, Corryong to the Great Alpine Road and on to Bright. BUT whichever way you come to leave plenty of time to spend many days based in Bright and exploring the Ovens Valley and Alpine High Country. It is 115 km from Albury also if you arrived there you can get a taxi.